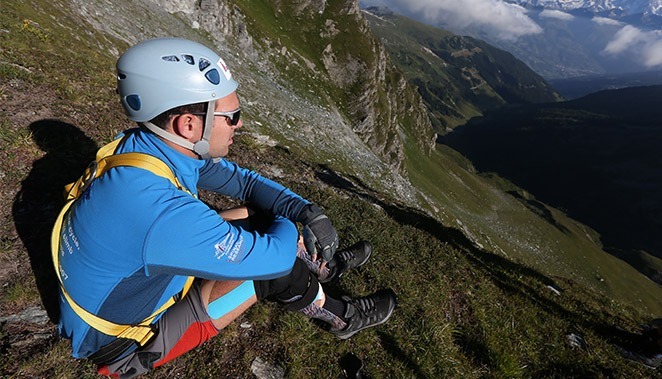 ROCKTAPE were incredibly proud last summer to support Paul Stewart, an ex-England Hockey Under-18 player who sustained an L1 spinal cord injury in December 2008 when an avalanche swept him 200ft off a cliff while skiing. He was instantly paralysed from the waist down and was told, aged just 27, that he would not walk again. 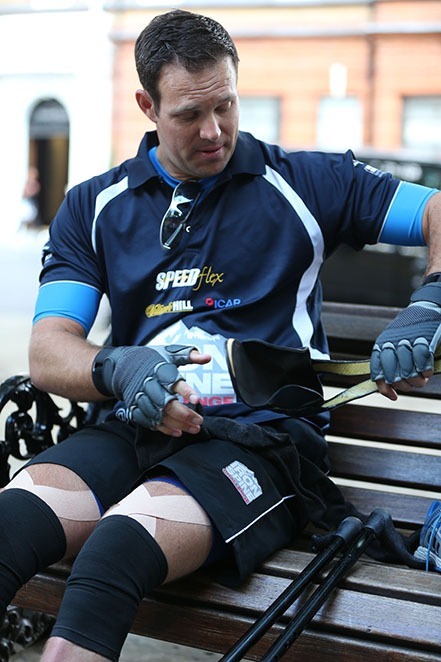 Still paralysed below the knee, Paul trained for 6 months to complete a truly awesome challenge that none of us here could even imagine undertaking. Despite the initial prognosis being nothing short of desperate regarding his chances of walking, Paul did regain enough limited muscle use to walk with the aid of leg braces and sticks and by using entirely different muscle groups to those normally employed in walking. Over 15 days, Paul would attempt his IronSpine Challenge, which would see him swim 2.4 miles, cycle 112 miles, walk 26.2 miles and then climb the cliff over which he was swept in 2008. During a show of phenomenal determination and resilience, Paul completed the challenge and, in doing so, raise £400,000 for Spinal Research. Here, Paul talks us through the nuts and bolts of his epic journey. How quickly did you progress to walking again after the accident? It took 4 months of intensive physiotherapy and rehab before I managed my first steps. It was a further 5 months before I was able to do anything that could be considered as walking and 1.5 years before I could walk as far as 500m in one go. To this day my walking is slow, inefficient and cumbersome. Were you back to being active or playing any sports before committing to the challenge? Prior to planning the challenge, I was playing a little wheelchair tennis and continuing with gym work and rehab. I started to train a bit more from November 2012 when the challenge started to become a reality and then every day from February to August 2013. The training must have taken its toll on your body? It did and I used a lot of ROCKTAPE during both the training and the challenge as I had a lot of problems. My shoulders rotate inwards while walking and that causes pressure on the nerves and a lack of feeling in my hands. I also suffered with Sciatica and muscular hypertension that were relieved by taping. How did the challenge go, from a physical perspective? The swim turned out to be OK, but the cycle was a lot harder than I’d hoped and, by day 2 of the walk, my muscles had basically given in and my knees had turned to jelly. From then on I had almost total ROCKTAPE coverage on my legs, a taping that took over an hour to apply. By the end, my heels had almost fallen off (literally, as I have no feeling in them), a lot of the skin on my legs had been worn off due to the braces and I had no feeling in my hands. 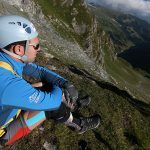 You will find details of Paul’s challenge at http://www.ironspinechallenge.com/.